I realised recently that I’ve barely touched this blog for most of 2016 and I suppose that’s because I’ve not done a massive amount of radio this year. My low powered QRSS/WSPR transmitter continues to run mostly 24/7 on various bands (on 30m at time of writing) and my radio high point of the year was being involved with the organisation and operation of the GB5RC special event station back in August. My Hexbeam is currently down following a rotator failure and although I have a replacement rotator, I’ve not had the time or manpower available to get it back up again. But I digress from the subject of this entry. A few weeks ago I bought a Raspberry Pi3 to use for my own personal DX Cluster to replace the old computer I have running Windows XP. I spent a while playing around with it, getting it working and then decided to look for other things to use it for. I re-discovered aircraft tracking using the ADS-B system. I had an old RTL-SDR dongle and so I bought myself a second Raspberry Pi3 and started experimenting. I went through a few different builds and finally ended up using the instructions on the ADS-B Receiver Project site. There are more detailed instructions on the Flightradar24 site showing how to set things up to ‘feed’ what you see to the internet. 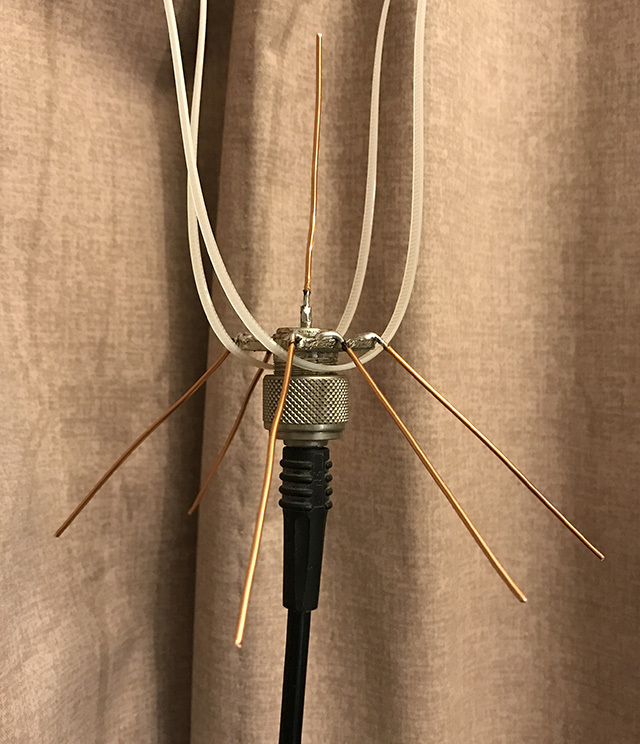 I started off by connecting a 6m/2m/70cms collinear to the receiver and I was receiving just a few aircraft out to 50 miles or so but I wasn’t overly happy with that so I built a quarter wave groundplane aerial out of some copper wire and an SO239 socket. By hanging that in my window, I was instantly receiving aircraft from over 150 miles away. Absolutely incredible. This wasn’t enough for me. I did some research and ordered myself a combined pre-amp and bandpass filter by Uputronics which arrived a day later and my reception range increased out to over 200 miles. I could have just set this up in the loft and forgotten about it, it would be a good setup. But of course, anyone who knows me will be aware that I don’t like to compromise and an internal aerial is a compromise. I could do better. I was spotting over 1,000 aircraft/day using that internal aerial so what could I do with an outside aerial? Two years ago, my 10m vertical broke in a storm and the pole it used to be mounted on was sitting outside. I sourced an external aerial, fitted it on the pole using my old run of RG213 and switched it on. Although I was receiving many more aircraft, they were all within 50 miles. A quick calculation of the cable I was using suggested well over 4dB of loss, so over 60% of the signal was being lost in the cable. It occurred to me that I had a run of EcoFlex 15 coiled up in the loft from my old VHF aerial installation so I fed that outside and ran it up the mast to the aerial. I’m now receiving more aircraft from further away. I’m still not 100% it’s working as it should be so I’ve ordered some test gear and once I’ve got that I can do some more checking. 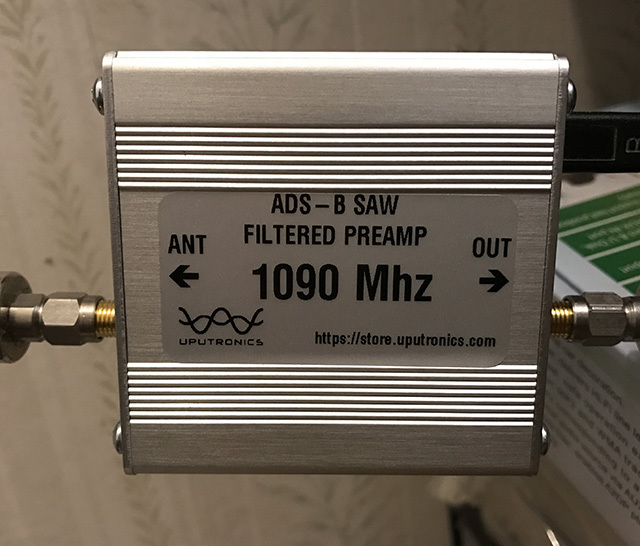 A basic setup for ADS-B reception can be done cheaply with a small home made aerial, a Raspberry Pi and an RTL-SDR dongle. I’ve gone a little further but this is a simple project which can be completed in an evening. This entry was posted in ADS-B, Construction, Data, Raspberry Pi and tagged 1090MHz, 1GHz, ADS-B, Aviation, Raspberry Pi. Bookmark the permalink.